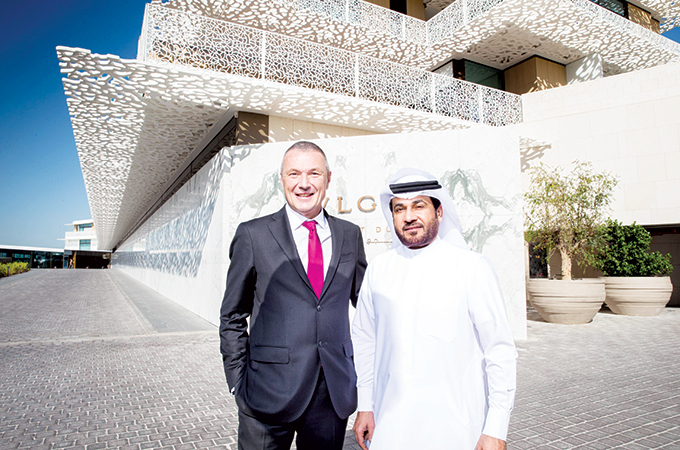 Bulgari Resort Dubai, a 'jewel' in the crown of Bulgari brand, received its first guests last month following the unveiling of the luxury property to a select audience at a gala event. Exclusively situated on the man-made seahorse shaped island of Jumeirah Bay and developed as an urban oasis by Dubai­based holding company Meraas, the resort brings Mediterranean village charm to the vibrant city of Dubai. Bulgari brand ambassadors and VIPs added celebrity sparkle to the gala event. Italian culture was at the heart of the event, including orchestral performances, a scenographic light show and the dance music of famous Italian DJ Mokai. Bulgari CEO Jean-Christophe Babin spoke of his pride at the resort’s launch and said: “This is a momentous day for us here at Bulgari, to launch in one of the most talked about cities in the world. We hope this architectural masterpiece, not only the stunning design of the resort by our architectural team, but the magnificence of a seahorse-shaped island, will truly put The Bulgari Resort Dubai on the map as being one of the city’s most iconic destinations”. The resort is expected to become the destination of choice for visitors seeking the solitude of an island escape, the residential feeling of a private house, yet situated just minutes from the heart of the city and its cultural attractions, said senior Bulgari officials. Terming the Dubai property as the jewel in the crown of Bulgari, Ursini said the resort sports contemporary Italian luxury residential design. Ranging from one- to three-bedrooms, with options to connect villas, the properties vary from 175 sq m to 540 sq m in size, all with a personal butler service and private pool and gazebo. The introductory tariffs range from Dh2,500 ($680) for the basic room to Dh20,000 ($5,444) for villas. The top-end 540-sq-m Bulgari Villa is priced at Dh40,000 ($10,889) per night. The resort offers several dining options as well. Renowned Michelin-starred Italian chef Niko Romito has curated a blend of modern and classical Italian concepts exclusively for II Ristorante by Niko Romito, interpreting the exquisite flavours of Italy with modern simplicity. In the same space of II Ristorante, guests will find II Bar, where they can enjoy signature beverages at the oval bar.